This is a guest post by Ken Davis at Funkatropolis. 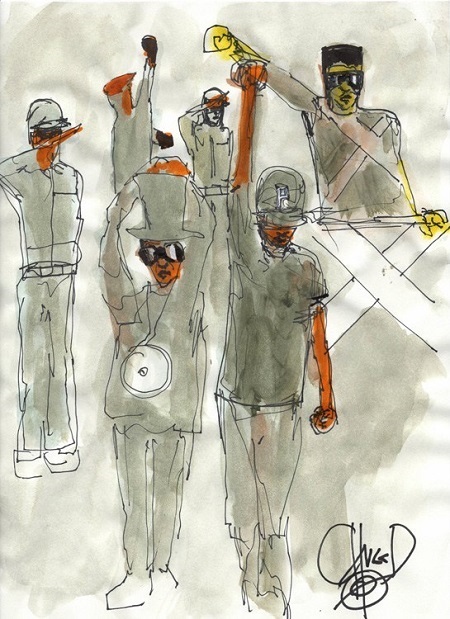 Hip-hop legend Chuck D is renowned for his formidable skills on the mic and politically charged tracks; but what many people aren’t aware of is that he’s also a talented visual artist. And those talents will be on full display at his first fine art exhibition, which will be held throughout March at Gallery 30 South in Pasadena, California. The exhibition, titled Chuck D: Behind The Seen, will feature artwork that the Rock and Roll Hall of Famer created over the years; many of the pieces were created while he was on tour. Before Chuck D (born Carlton Douglas Ridenhour) was the outspoken frontman of groundbreaking rap group Public Enemy, he was a graphic design major at Long Island’s Adelphi University. He already had a love for hip-hop and would use his graphic arts talents to design promotional flyers for upcoming hip-hop events. He was also the first black student to write and draw a comic strip for the university’s student newspaper, The Delphian. In addition to Shocklee, Chuck D met musician/rapper William Jonathan Drayton, Jr.—better known by his stage name Flavor Flav—at Adelphi, as well as college radio station program director Bill Stephney (future Bomb Squad member and Def Jam executive). Chuck D and Drayton hit it off and began hanging out and rapping together. Chuck D formed Public Enemy in 1982 while still a student at Adelphi,and he earned his B.F.A. in graphic design from the university in 1984. (He later received an honorary doctorate from Adelphi in 2013.) Following graduation, he maintained his love for hip-hop and continued to develop Public Enemy. In 1986, the group signed with rising record label Def Jam Recordings. Public Enemy released their debut album, Yo! Bum Rush the Show, on the label in 1987. The album reverberated throughout the hip-hop community with its strong political themes, powerful raps and the Bomb Squad’s hard-hitting, densely layered production. The album signaled a new direction for hip-hop in which rap artists began addressing social and political issues on their tracks. The lineup for Public Enemy when they dropped Yo! Bum Rush the Show was Chuck D, Flavor Flav, Terminator X (born Norman Rogers), Professor Griff (born Richard Griffin); and the Bomb Squad—Hank Shocklee, Eric “Vietnam” Sadler, Carl Ryder (Chuck D’s production pseudonym) and Bill Stephney. Chuck D would often use his graphic arts talents to design Public Enemy-related artwork, including the iconic b-boy caught in a rifle’s crosshairs logo. The group followed up Yo! Bum Rush the Show with their landmark album It Takes a Nation of Millions to Hold Us Back (1988),which is considered one of the most influential albums of all time. The platinum-selling collection was a revelation and forever changed the game in hip-hop. Public Enemy’s hot streak continued in the early ‘90s with the release of two more rap classics: Fear of a Black Planet (1990) and Apocalypse 91… The Enemy Strikes Black (1991). The influential rap outfit released more great albums in the ensuing years and have thrilled audiences around the world with their dynamic live shows. The group dropped their most recent album, Nothing Is Quick in the Desert, in late June of last year. And in addition to performing with Public Enemy, Chuck D tours with rap-rock supergroup Prophets of Rage. For more information about Chuck D’s upcoming fine art exhibition, visit Gallery 30 South’s website. This was written by Lorrie. Posted on Friday, February 2, 2018, at 10:00 pm. Bookmark the permalink.